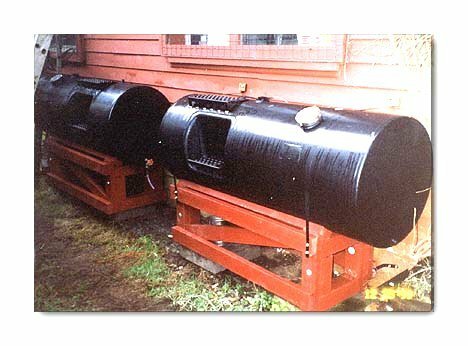 Preparing your kerosene heater for summer storage is a regular maintenance routine that absolutely should be done every year, thus ensuring the heater is in perfect condition for use. And the same maintenance items should be checked to ensure the heater ready for winter use. 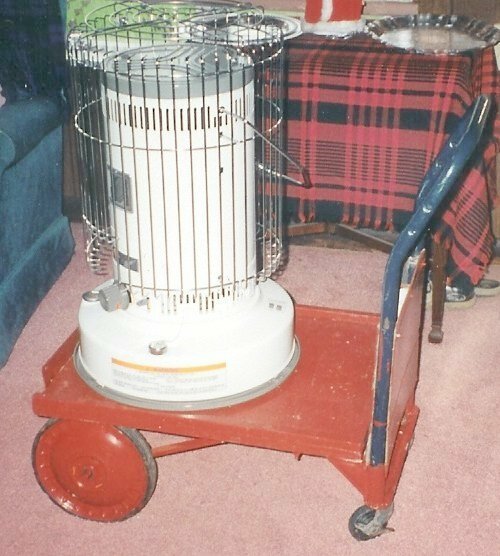 Properly cared for, your heater will last for many decades. Some Perfection heaters are used every winter after a century of use...with proper care for storage during the summer. It isn't hard or complicated to properly prepare a heater properly. The heater should be burned dry, any carbon or tar buildup around the wick removed, and if needed, a new wick installed. Why wait? Any rust or corrosion should be treated to prevent further problems. Loose carry handles or other cabinet problems should be fixed. Repair the catalytic converter burner unit if flame spikes are present. Regular maintenance of kerosene appliances involves care of the wick, the wick raising assembly, plus the main body of the appliance itself. I have seen fiberglass wicks with so much tar buildup on top that they cannot be withdrawn into the wick raising assembly, ratchets and levers so dirty they could not be moved, even wicks rusted to the center support column! All of those are the fault of the user, not the heater or stove. The wick raising assembly can be carefully scraped and then cleaned with an old toothbrush and kerosene and wiped dry. "Tri-Flow" (or silicone) penetrating lubricant can then be sprayed on all moving parts; when it dries it leaves a film of Teflon and silicone, and that will keep it working for well for another year. If there is rust present on the central post assembly because someone stored the unit wet (with fuel in the tank) and water condensed and was able to get to the carbon steel pillar around which the wick fits, then wire brush the rusted area and sand it smooth with fine grit emery paper. The area around the wick gap (below) often gets tar or carbon deposits, which can be cleaned off easily when cool and therefore brittle. Wick raising assembly at left, igniter with electric wire leads shown on right side of illustration. Trace those wires and clean all the contact points all the way to the battery terminals. Virtually all kerosene heaters use 2 batteries (C or D size) to provide the electricity to heat the igniter to light the heater. The contact points of this system can corrode, so they do need periodic attention. The best electrical contact cleaner I have found is Tronic Kleen Plus Lube, available from Radio Shack stores. Remove the batteries, spray with the "Tronic Kleen Plus Lube," and wipe dry. Trace the wires from the battery and you should find a long, flexible copper contact strip which is touched by the igniter contact when you move the ignition lever. That copper strip can become corroded, and then the lighting system will not work. Light sanding with fine grit emery cloth will restore the copper surface, then spray with Tronic Kleen Plus Lube, wipe dry, and it will be protected against corrosion throughout the heating season. Most igniters resemble a flashlight bulb with the glass removed and a tiny resistance heating coil on the top. That heating coil can become corroded, clogged with debris, or break. 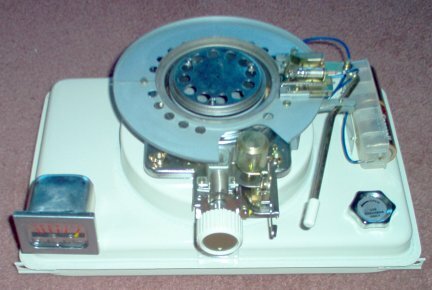 The igniter can be checked for proper operation by replacing the batteries, moving the igniter operating lever, then observing if the heating coil glows red hot. For maintenance, remove the igniter, spray into the contact receptacle with Tronic Kleen Plus Lube, then replace the igniter. If the igniter is damaged, it should be replaced with the correct igniter - there are four different types of igniters! The photo at left shows an Everglow P-E12 fuel tank with attached wick raising system and the electric ignition system on the right. The lever is moved to the right, which moves the igniter to the left to contact a copper strip contact point and then the raised wick. I bought the heater as unused on eBay in late August, 2006. The ignition system did not work, which was probably the reason it was sold. A continuity tester showed good contacts. The batteries produced 3.2 volts at full amperage...and didn't work. The batteries were shorting themselves out! I replaced the batteries and it works just fine. Click photo to enlarge. When the kerosene heater is prepared for storage for the summer, remove the batteries and clean all the electrical contact points. Before use in late autumn, the electric starting system should be in good condition, awaiting only the installation of new batteries. Virtually all kerosene heaters and stoves are made of steel, either painted or enameled for a pleasant appearance and rust prevention. Most modern heaters have a baked enamel finish. "Perfection" heaters were painted, and as a result will rust easily...they should be cleaned and polished twice a year. When the appliance is being prepared for storage, it should be burned dry (not Perfection heaters! ), then completely disassembled. The body of the unit, including the stainless steel reflectors on radiant heaters and stainless steel grillwork on convection heaters, should be cleaned and polished with a good grade of auto polish/cleaner: my favorite is "Meguiar's Cleaner/Wax," which the maker claims is America's top selling cleaner/wax. It's cheap, and it works. Don't forget to polish the inside of the metal cabinets, as they are often unpainted and rust easily if not protected with metal polish. The auto polish will seal the pores of the paint and steel, greatly reducing the chance for rusting. This heater has been used to heat my shop for 10 years, and is as pretty as when new. If rust is present. First, if the rust is not too extensive or deep, a small brass brush is used to remove all rust scale and debris. Be sure to remove any enamel, paint or chrome from the edges of the rusted area. The area can then be sanded to remove high spots and "feather" the edge of surrounding paint. To protect the areas you have cleaned, they must be neutralized to prevent the oxidation from eating right through the metal. "Ospho" (phosphoric acid) neutralizes rust, and is available in many hardware stores. Use a small, cheap paintbrush and carefully apply a thin coating Ospho to the cleaned rusted area. Do not spill any Ospho on painted surfaces or they will be stained! Ospho needs a temperature of about 70 F to properly dry. You will know the Ospho has worked and is "cured" when the rust turns very dark and is no longer tacky to touch. That area should not rust again, particularly after the application of a good coat of paint. Thanks, Tom! Paint: A good quality engine block paint rated at 1200 F will normally work very well, but color matching is difficult. Tom Poserina found that Chrysler 300 White touch-up paint from Wal Mart was a perfect match for the paint on the fuel tank of his Omni 105 "E". I thought I'd also mention I found an almost identical match to the off-white color Toyotomi used on their Radiant series. I went to one of our local O'Reilly stores (national chain of auto part stores) and found a can of Dupli-Color's "Perfect Match" series of automotive sprays; their "Wimbledon White" color for Ford vehicles is a dead ringer for Kero Sun's. It was actually cheaper to buy a spray-can than the little touch-up paint tube, so I used the old technique of simply spraying enough onto some cardboard until it pools and used a broken toothpick to apply it to the chipped areas of the heater. Just thought you might be interested in passing it on. Thanks again for all the hard work you do maintaining your website. It shows that you care about the products you sell! Travis G.
The two inner cylinders of the catalytic converter are spaced so that one fits inside the wick and one fits outside, so the wick is between the two perforated cylinders. The wick bring fuel to the base of the cylinders through capillary action. When the catalytic converter is up to operating temperature, the fuel vapor is combined with oxygen flowing through the perforations. The flame is then between the cylinders, not from the wick - the rings convert fuel vapor to clean, virtually odor-free flame heat. The two steel cylinders of the catalytic converter are soft and easily damaged. Even if made from hardened steel, the heat produced by the stove in use would quickly anneal the cylinders and make them soft. 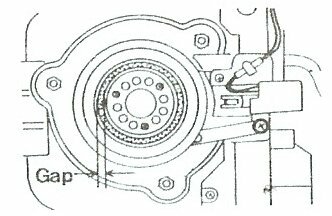 Normal bouncing during transit, storage or use can result in nicks or an uneven bottom edge of the converter rings. If the bottom edge of the burner rings is not perfectly flat, an air leak and cause extra oxygen to enter the space between the cylinders, upsetting the delicate air/fuel mixture and causing an flame spike. And that air spike will cause sooting if it is high enough to impact the bottom of a pot or pan. An "flame spike" can be caused by too high a wick as well as an air leak. To determine the problem, grab the wire handle (see photo above) on the catalytic converter and move it slowly from side to side while watching the flame. If the flame spike does not move, the cause is a wick too high at that location - the wick is not level. Remove the wick and reinstall it so it is level on top. If the flame spike moves with the catalytic converter, the cause of the flame spike is an air leak from the base of the burner. That is relatively easy to fix. Place a new sheet of sandpaper of 120 to 150 grit on a flat surface, like a Formica countertop. Place the catalytic converter base down on the sandpaper close to you and hold an edge of the sandpaper down against the countertop. Then gently stroke the catalytic converter away from you, one stroke only!, while keeping the catalytic converter as flat as possible. Lift the catalytic converter and return it to the near edge, then make another stroke. Now examine the bottom edge of each cylinder. The shiny spots were high spots that were sanded down. The dull places are too low and will cause an air leak. Repeat the sanding strokes until both cylinders are shiny rings all the way around. Bingo, no air leak. Many, if not most convection heaters have a carry handle in the shape of a "U" which attaches to the heater by simply slipping into holes on each side of the tower assembly. The problem is that one side of the carry handle can slip out and the heater can be dropped. This problem is almost universal...and extremely easy to fix. Remove the top safety grill, then the top plate on the heater. Now you can look down into the heater and see the ends of the carry handle protruding through the metal sides of the heater. Slide a 5/16" washer over each end, then a 1/4" "Kwik-Clip" over each end and slide it back as far as you can, and the carry handle will not be able to come loose again. Some carry handles are less than 1/4" diameter chromed rod and would require a smaller "Kwik-Clip," and they are available in just about any small diameter. 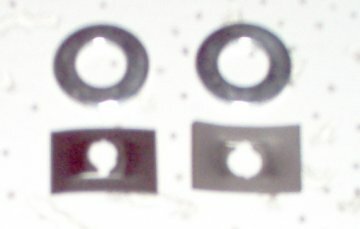 The photo at left shows 1/4" "Kwik-Clips" and 5/16" washers. The "Kwik-Clips"(also called ''Speed Nuts") are part #08236 00661 or 08236 00672 at True Value Hardware stores, and cost all of 15 cents each. The 5/16" washers are 5 cents each. For 40 cents you can solve an aggravating problem! The unit is now cleaned and polished, the mechanical wick raising assembly cleaned and lubed as is the electric starting system, and the appliance body polished and thus protected against stains and rust. The fuel tank is empty, so water vapor will not condense in it and cause rusting. You removed the igniter batteries when you removed the cabinet body, so no galvanic corrosion should take place in storage. And you have examined the wick, and if replacement is needed, now is the time to at least order the proper wick. Now the unit may be safely stored -- covered! 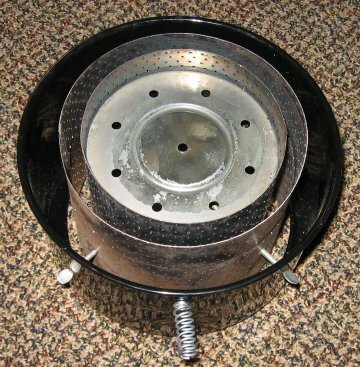 -- in a dry area, and you can be certain your kerosene heater will be ready for use just as soon as you need it again. Is this all really important? Yes. I have had to practically rebuild convection heaters from scratch for friends because they were simply put into a damp outbuilding after the last use. They were rusty and a real mess, and there is no excuse for it! A few years ago I was given a Toyotomi RCA-87 radiant heater for free. It had been put away wet -- in a barn loft, under hay bales. It was rusty and dented, the electrical starter system so corroded it could not be fixed, with mouse nests in the wick raising assembly area. I was able to make it work again, but it wasn't worth the effort...a $200 heater ruined for lack of a half hour of maintenance work! If you follow the guidelines above for regular maintenance before storing your kerosene appliances, they will keep in pristine condition and be ready for use within 20 minutes of when you need them -- just fill with fuel and install the batteries. You need an inexpensive electrical tester for the ignition system. And you will probably need a third hand to help you because you need two hands to hold the leads and someone else to push down the igniter button when you get to that point. Without batteries installed, use the continuity tester for the + and - on the battery box, then each wire up to the connector. Then test the continuity through the switch while someone engages the igniter to full on. That will isolate the bad connection. Then you can use 600 grit emery to clean the contact. Reinstall the batteries and check for voltage at the battery box, at the igniter itself as well as at the first connection. It should read very close to 3 volts DC. Often the bad contact is right in the center of the plug socket itself - the positive wire. Insert a pencil-style ink eraser into the plug-in and twist it to clean that contact. Go gently and do not bend the folded copper contact at the bottom of the receptacle down to far or it will not make contact with the base of the igniter. Run your final voltage check from the center probe in the receptacle while holding the negative contact on the outside of the socket while someone engages the igniter. The fuel tanks are not difficult to clean. Kerosene is not called "paraffin" in Europe without a reason: kerosene precipitates paraffin and other waxes. The waxes, being tacky, almost attract and hold all kinds of detritus. Nothing dissolves those waxes, but they generally melt at less than 180 degrees F. Boil water in a tea kettle until it whistles at 212 F, then pour into the tank. Replace the cap, swish around quickly, then pour out. All kinds of melted stuff will pour out with the almost-boiling water. Repeat several times. Finally, to remove residual water, pour in at least a cup of 91%+ alcohol, swish around, and pour out. Air dry with the cap off before use.